PureWay's newest addition to our equipment line is the EXCOM Hybrid 6 manufactured by METASYS Medizintechnik (imported by Pure Water Dev LLC.). This dental vacuum pump is performance without compromise and will provide all of the benefits that come with utilizing a dry vacuum system with none of the compromises most vacuum systems require when switching. The EXCOM will be available on a limited basis to select dealers within our network. For more information about this system, please contact your dealer and ask them about the new Dry Vacuum System by PureWay! The PureWay EXCOM Hybrid 6 is a dental vacuum pump (dry vacuum system) used in dentistry for centralized vacuum production, as well as the separation of air and liquids. The suction engine (vacuum engine) is a powerful dry vacuum engine operating according to the principle of the side channel vacuum pump. This unit centrally separates liquids and solids from the air stream without any interruption of the suction's output performance. This eliminates the need for an air/liquid separation tank and provides one of the first ever tankless dry vacuum systems! Pump Dimensions - 14.9" x 17.3" x 24.4"
1. What is the difference between wet vacuum systems and dry vacuum systems? Wet vacuum systems use water to create the suction power but this requires a constant flow of water and can consume tens of thousands of gallons of water per year. A dry vacuum system does not require water to create suction power which leads to a major savings by less water consumption. 3. Do I need to replace the oil regularly with the EXCOM hybrid 6? The EXCOM hybrid 6 creates a strong suction without using any oil so there is no maintenance required for the oil. 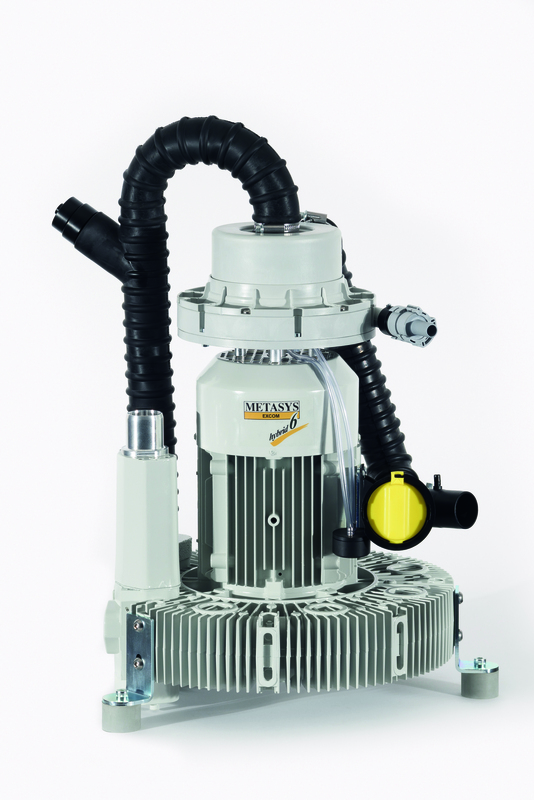 The Excom hybrid 6 is a oil free dry vacuum system. 5. 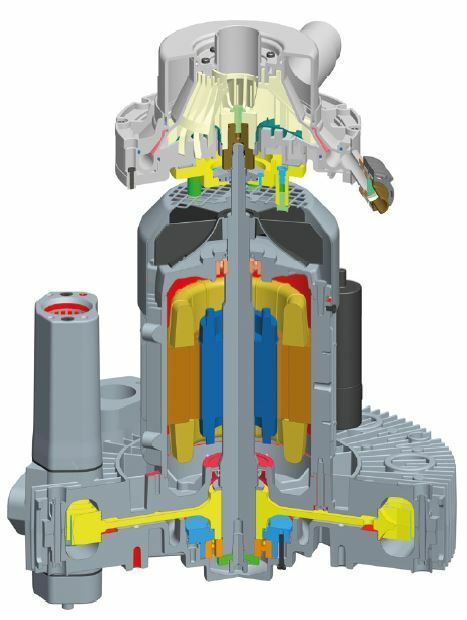 What size vacuum line does the EXCOM Hybrid 6 use? 7. What is the warranty? 2. Does the PureWay ECO II work on the EXCOM hybrid 6 dry vacuum system? Yes ECO II was specifically designed to work with the EXCOM hybrid 6. 4. How do you drain the water from the system? The EXCOM hybrid 6 is a tankless system and does not have a tank that collects water and/or that needs to be drained. This eliminates multiple issues related to buildup of bacteria and biofilm that are common with wet vacuum systems. 6. Do I need to put the vacuum in a different room than my other equipment? The EXCOM hybrid 6 does not need to be in a separate room as your other equipment like a compressor, etc. The unit does need to have proper ventaliation and a way to remove the hot air created by the system. As is common with most dry vacuum systems. 8. What maintenance is required for the EXCOM Hybrid 6? Due to the superior engineering of the unit, virtually no maintenance is required aside from the cleaning of the vacuum trap and perhaps the air/water separator cleaned by a technician once per year. Looking for waste management regulations for your state?